There is a mangrove program on the island of Tablas, but it is in disarray and not at all well managed. Meaningful Volunteer is hoping to change that. 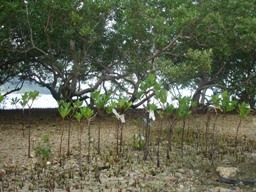 There is a famous Filipina mangrove expert called Dr. Primervera who lives quite close to Romblon. Meaningful Volunteer hopes to bring her to the island and seek her expert advice. If you walk along the beach, you will find many structures destroyed by Typhoon Frank which do NOT have mangroves in front of them. There are other flimsy structures that did survive Typhoon Frank and DID have mangroves in front of them. This further gives weight to how useful mangroves are at providing a natural barrier to tsunamis and other natural disasters. Project Mangrove is also looking at forming close ties with the kids at the RYE School. If the children help out for a weekend planting mangroves, then that is good enough for one terms worth of fees.